Heavy wildfire smoke is the suspected cause of a fatal four-vehicle collision on Interstate 90 near Ellensburg on Thursday, according to the Washington State Patrol. A 93-year-old woman died, and the driver of her truck pulling a travel trailer was also seriously injured. A brush fire in the highway median began late Thursday morning, contributing to the collision that involved a semi-truck, the truck pulling a travel trailer, one truck and a car. The vehicles were all traveling normally on I-90 eastbound when they entered the wildfire smoke. According to the WSP, a truck (1) slowed down for traffic caused by poor visibility from smoke when the semi-truck (2) rammed into the back of the truck (1). The truck pulling a travel trailer (3) then rear-ended the semi-truck (2), then jack knifed and was hit by a car (4). The WSP is investigation the collision. Seven people were involved in the crash. Fire crews worked to contain the blaze, which burned about 100 acres. The cause of the fire is still under investigation. 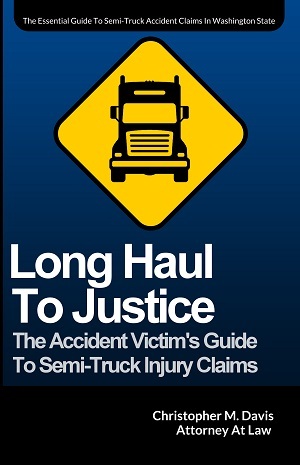 Unfortunately, accidents involving a semi-truck are all too common. There are over 500,000 truck accidents in the United States every year, including 3,940 in Washington State in 2016. Of those crashes in the Evergreen State, 32 were fatal. Was the semi-truck driver able to see the car in the roadway? Truckers should be able to see obstructions or hazardous conditions ahead of them. Poor visibility caused by the smoke in the accident above will certainly be a major topic in the investigation. Was the semi-truck driver distracted inside the cab? Paying full attention to the road and not being distracted by phones or other technology is important for truckers. How long had the semi-trucker driver had been working? Commercial truck drivers have strict regulations on how long they can be behind the wheel. Washington State is a “comparative negligence” jurisdiction, meaning each driver’s degree of fault matters and will impact how much damages can be recovered. It allows a judge or jury to establish which percentage of responsibility, if any, can be assigned to the victim. The total recoverable damages are then determined by that percentage number. If you or someone you know has been injured in a semi-truck accident, you likely face a long road ahead. You may be entitled to thousands of dollars for your injuries, wage loss, pain and suffering and long-term care. Despite the horrific and sometimes tragic nature of semi-truck crashes, it is important that those involved and their family members understand their legal rights. Trucking companies waste no time sending a team of investigators to the scene of the crash to interview witnesses and injured victims. Those who consult with an attorney after a crash are much less likely to be taken advantage of by a trucking company and its high-pressure defense lawyers. There are many complexities in a crash involving a semi-truck. An experienced attorney with a strong track record representing victims of these types of accidents can help get you the compensation you deserve while you recover from your injuries. If you or a loved one has been seriously injured in a semi-truck accident in Washington State, contact attorney Chris Davis and the team at Davis Law Group, P.S., at (206) 727-4000 or use the form on this page to schedule your free legal consultation.